Florida-based Oppenheim Architecture + Design, in collaboration with Switzerland-based Huesler Architekten, have created an ultra-modern office for themselves in an old farmhouse dating back to 1743 in the City of Muttenz/Basel, Switzerland. This adaptive-reuse project in the historic center of the city incorporates several sustainable design strategies, like the use of MINERGIE (energy-efficient) construction standards, solar power and reclaimed materials. The team not only put the original farm house to use, they also added a new residence in its back yard, creating a live-work situation unlike any other. Oppenheim and Huesler successfully walked the fine line between restoring the historic feel of the original farm house and creating a contemporary, minimal aesthetic that is appropriate for today. They created lots of new openings to add much more natural daylight into the farmhouse. They made the attic useful by making it a daylight-drenched, bright white, vaulted work space. Another way they modernized the farm house is by untangling formerly chopped-up spaces, creating a feeling of openness that is very much the preferred aesthetic of the modern-day work space. 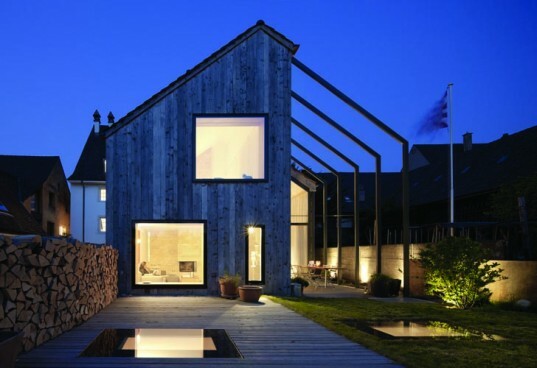 Reusing an existing historic farm house is of course sustainable in itself, but Oppenheim and Huesler go above and beyond. They used MINERGIE (energy-efficient) construction standards, added solar panels to the roof, used reclaimed wood on the façade, and restored existing architectural elements where ever possible. One of the most exciting parts of this project is the new residence in the back yard, which maintains a connection with the history of the farm house, yet very boldly asserts a modern and minimalist aesthetic. The old farmhouse and the new residence tie together by some shared materials and colors, but they are recognizably distinct. The juxtaposition of the very modern new residence nestled behind the farmhouse doesn’t take away from the history of the area, but rather enhances it by creating a stark contrast between old and new. The new residence has three floors, with the bedrooms on the third floor, the kitchen, dining, and living spaces on the ground level and the children’s bedrooms located below grade with a ramped outdoor backyard terrace. The new building lends an ample and beautiful living space in conjunction with the renovated historic farm house creating a uniquely old and new live-work project. The juxtaposition of the very modern new residence nestled behind the farmhouse doesn’t take away from the history of the area, but rather enhances it by creating a stark contrast between old and new. Oppenheim and Huesler successfully walked the fine line between restoring the historic feel of the original farm house and creating a contemporary, minimal aesthetic that is appropriate for today. They created lots of new openings to add much more natural daylight into the farmhouse. Another way they modernized the farm house is by untangling formerly chopped-up spaces, creating a feeling of openness that is very much the preferred aesthetic of the modern-day work space. They made the attic useful by making it a daylight-drenched, bright white, vaulted work space. 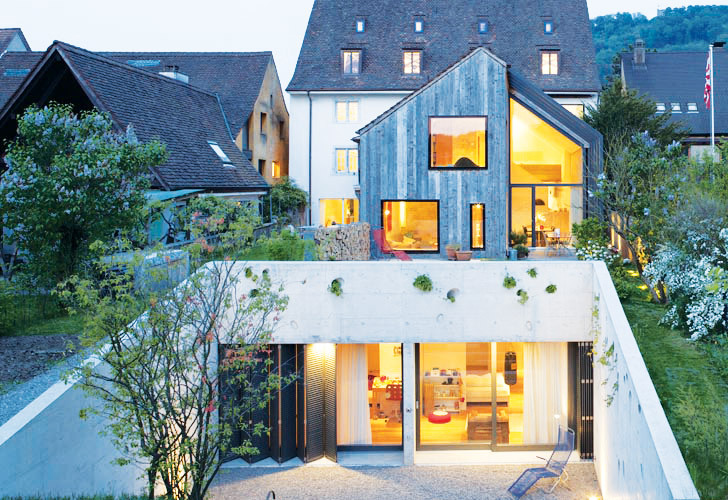 Adaptively reusing an existing historic farm house is sustainable in itself, but Oppenheim and Huesler go above and beyond. They used MINERGIE (energy-efficient) construction standards, added solar panels to the rood, used reclaimed wood on the façade, and restored existing architectural elements where ever possible. One of the most exciting parts of this project is the new residence in the backyard, which maintains a connection with the history of the farm house yet very boldly asserts a modern and minimalist aesthetic. The new residence has three floors, with the bedrooms on the third floor, the kitchen, dining, and living spaces on the ground level and the children’s bedrooms below grown with a ramped outdoor backyard terrace. The new building lends an ample and beautiful living space in conjunction with the renovated historic farm house creating a uniquely old and new live-work project. Though the resident is ultra-modern, elements like this wooden dining table add warmth. View and daylight into the residence and office make the use experience extra special. Though it's in an urban setting, this project creates some great open space. The underground children's suite also gets access to views and daylight due to smart site design. A serene retreat from the hustle and bustle from the adjacent office.